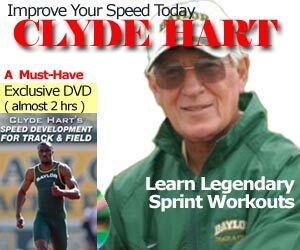 I am firm believer you need to work on different speeds for 800m and 1500m runners. You need some mileage, both recovery miles and aerobic miles. That WR pace is equivalent to 61.3 per 400m. So her “magic workout” leading up to her 1500m world record was 6 x 800m at 1500m race pace with 2 minutes recovery. When she did that, she knew she was ready. She knew how it was going to feel in that last lap… because she has “been there” before. I have a lot more workouts, but I won’t print them because everyone is going to copy them without understanding the hows-and-whys you do a particular workout. You have to understand the exercise physiology of the workouts, and where you are in the season.